Duette blinds feature a unique honeycomb construction that makes these shades soft, durable, and highly energy efficient. 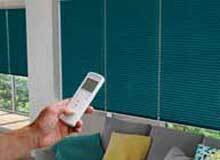 The blinds built-in insulating characteristics help keep the heat out in summer and the warmth in during winter. Duette Blinds are available in many beautiful fabrics, rich structures and in three transparencies. This makes precise light control and privacy possible. They give a beautiful pleat pattern to windows of all shapes and sizes. The large range of colours allows you to create the desired atmosphere for your living room, kitchen or bedroom. 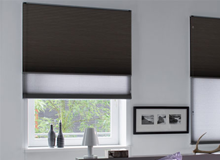 Duette blinds do not have any visible drilling holes for the pull cords, providing a beautiful uniform appearance. They can be operated manually or motorised. Duette blinds feature a unique honeycomb construction that makes these shades soft, durable, and highly energy efficient. The shades built-in insulating characteristics help keep the heat out in summer and the warmth in during winter. 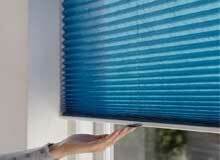 Highly versatile, Duette blinds are available in hundreds of colours and a wide variety of semi-opaque, and opaque fabrics. 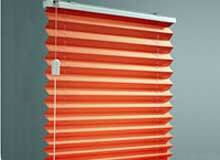 Duette blinds are a perfect solution for windows of most every size, shape, and situation. Duette® Fashion Shades are available in three fabric opacities, for precise light control and privacy, and offer a perfectly stable pleat pattern for every window size and shape. With Duette, there are no visible lift cords for a clean, dressed look. Choose from a wide variety of semi-opaque and opaque fabrics, as well as hundreds of colours. The ultimate in versatility, Top-Down/Bottom-Up Duette blinds offer you the ability to operate blinds from the top down, the bottom up, or in combination of the two. Quite literally the best of both worlds. 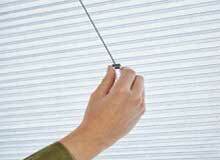 SmartCord™ uses a revolutionary and patented cord mechanism to raise and lower the blind. 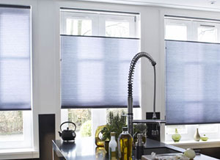 It features a retractable pull cord that maintains a constant cord length, which means no more dangling cords to detract from the appearance of the blind and offers an effortless and child friendly operation.